Headers can represent a sizable investment, so you'll want to keep them securely attached. In addition, exhaust leaks can cost you power and even cause damage to your vehicle. 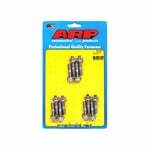 ARP stainless steel header studs are the answer. They're made from premium 300 stainless steel, which is rated at 170,000 psi tensile strength--much stronger than Grade 8 steel. These studs are also highly corrosion and heat-resistant, for long service under the toughest conditions, and they're polished to a mirror-like shine. Each kit includes the specific number of parts for the desired application, plus premium-quality washers and either hex or 12-point nuts. ARP stands behind their products indefinitely with respect to materials and workmanship. Automotive Racing Products would like to deal with the customer directly when they have a problem. Automotive Racing Products is interested in customer satisfaction and will make exceptions on an individual and case-by-case basis.